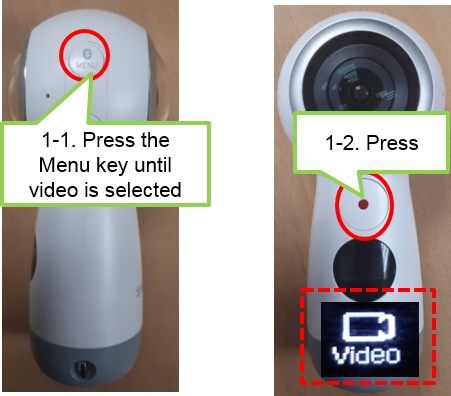 Samsung Gear 360 (2017): How do I record video using my Samsung Gear 360? Step 2. Press the OK key to record a video. While recording, the camera status light will flash red, and the recording time will be displayed on the camera status screen. Step 3. Press the OK key to finish recording the video. The video will be saved in the Gear 360's memory card. The available video recording time will be displayed on the camera status screen. Gear 360 and its battery may heat up. wait for it to cool down before resuming use. - Large files will be divided into 1.8 GB units and saved.